This entry was posted on May 2018 by Adam Sweet. Technology is transforming dental offices, but to maximize the impact of that technology, every dental professional must be trained to use it to its fullest potential. 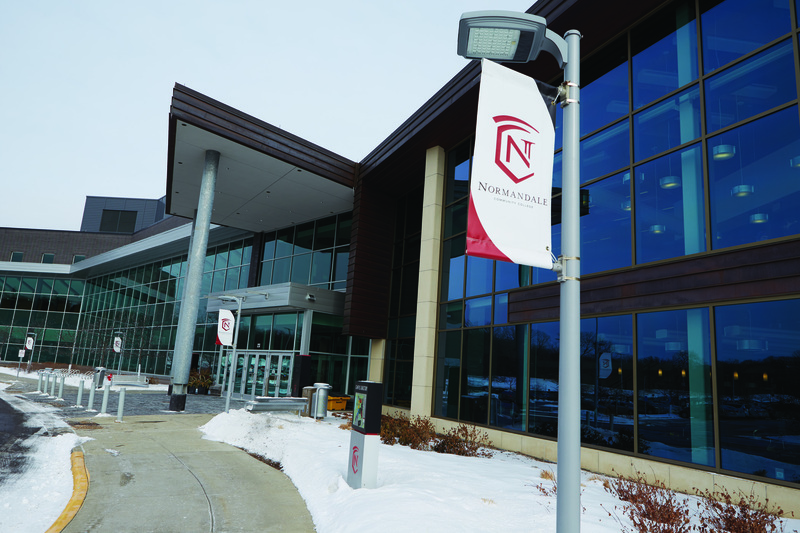 Normandale Community College in Bloomington, Minnesota—the largest community college in the state—is one of those training grounds. 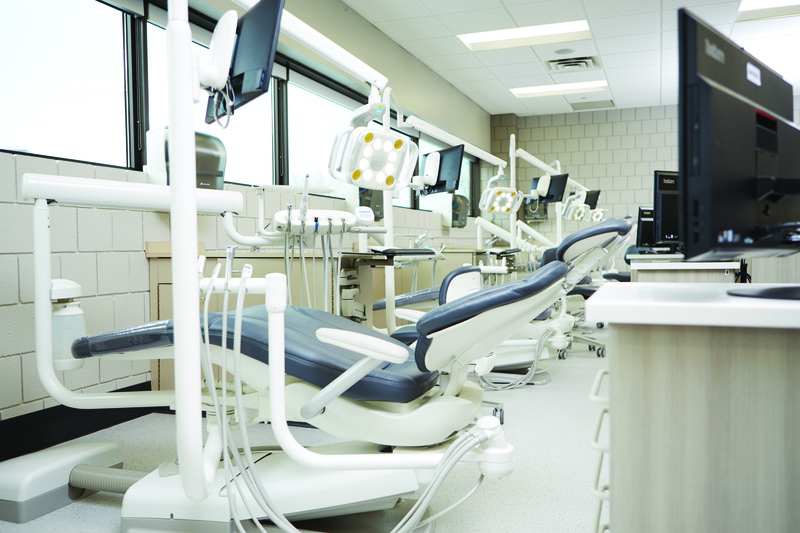 Its dental hygiene program has existed since 1969, and it recently expanded to offer the first Advanced Dental Therapy Master’s Degree program in the country through a partnership with Metropolitan State University. 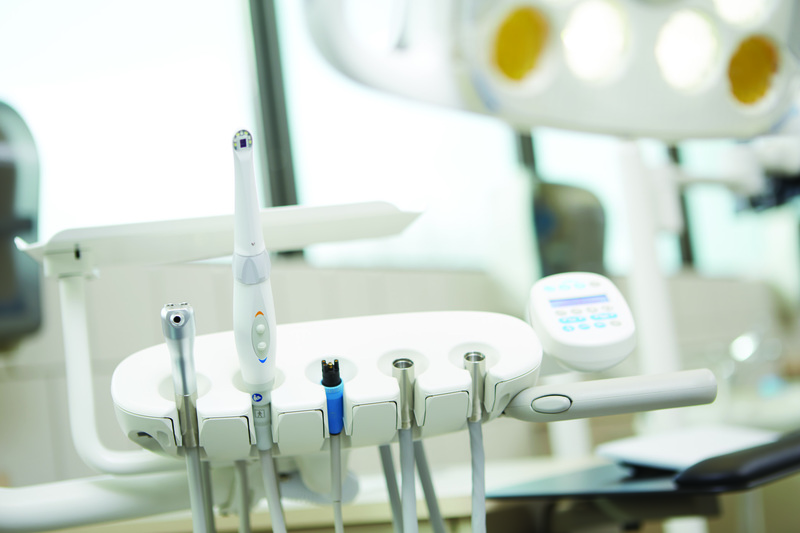 That degree allows licensed dental hygienists to complete routine restorations and extractions. 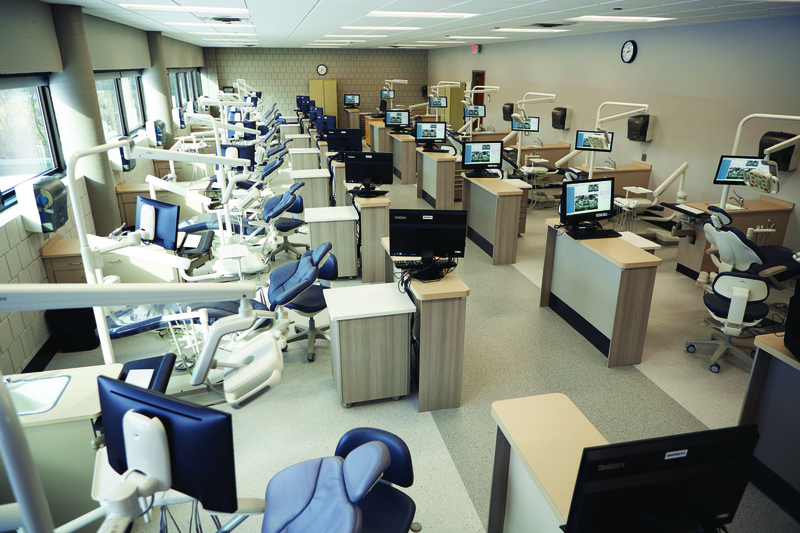 As a college clearly on the cutting-edge of dental education, it is imperative that Normandale’s dental clinic—which provides opportunities for students to hone their skills on patients while providing discounted services to the community—trains students on the advanced technology they will likely use once they graduate. The clinic’s last remodel was in 1997, with some retrofits done in 2005, but a more comprehensive upgrade was due. The college had launched a long-range equipment plan seven years ago. Some of the main pain points on the list that needed to be addressed were retrofitted handpieces with inadequate water flow; ultrasonic and hand polisher units that required setup for each appointment; single monitors that were set behind patients, making it difficult for viewing; and a limited number of intraoral cameras that were shared among 24 operatories. 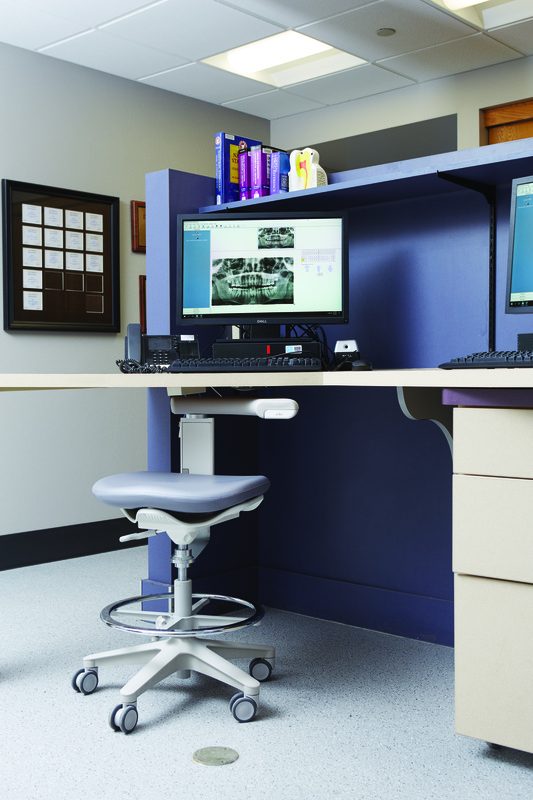 In 2017, the clinic had 3,200 patient encounters, so new equipment would need to be efficient, ergonomical, and robust enough to stand up under heavy usage. Normandale’s dental clinic had 3,200 patient encounters in 2017, providing a valuable service to its community. 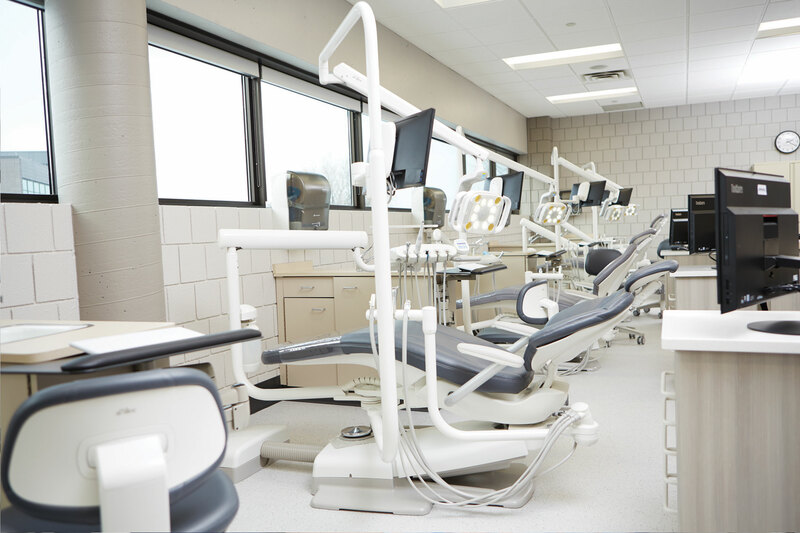 It also provides a state-of-the-art clinical setting for hygienists and dental therapists to apply their skills. 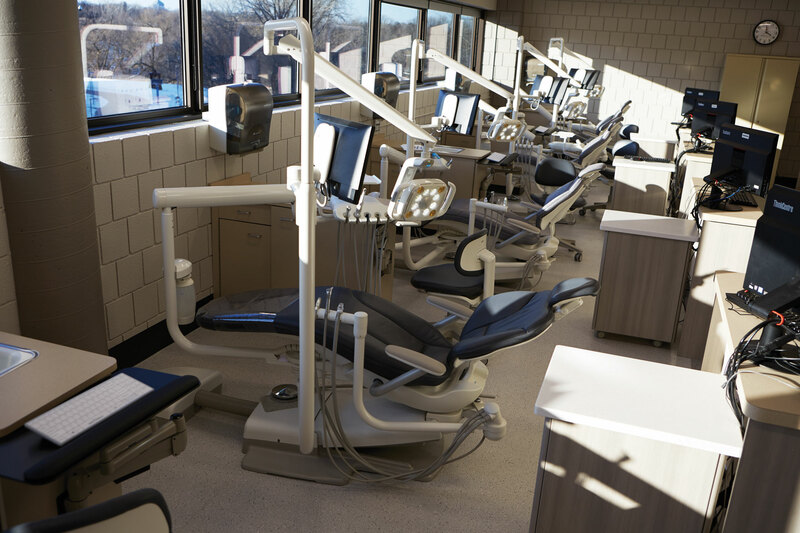 The college’s existing operatory equipment was manufactured by A-dec, and it had performed well, so going with A-dec again was a natural choice for the upgrade. The entire project was put out to bid, and Henry Schein won the job. “Henry Schein met every condition in the bid, plus more,” explained Dr. Brickle. She also noted that Henry Schein had received positive reviews for their contribution to the renovation of metropolitan State University’s Advanced Dental Clinic. 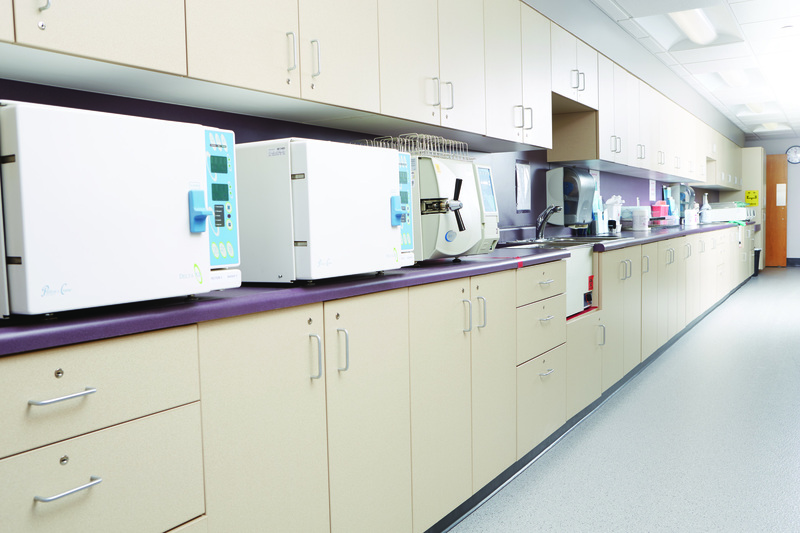 Henry Schein, A-dec, and a team of contractors partnered together over several months—and many meetings—to fine-tune the operatory equipment choices and configurations. Michael Minor, Henry Schein Regional Equipment Manager, said there were several reasons the collaboration was so smooth and successful. This high-volume, highly functional office provides a cheerful greeting to patients, with bright wall colors and complementary finishes on the chairs and carpeting. 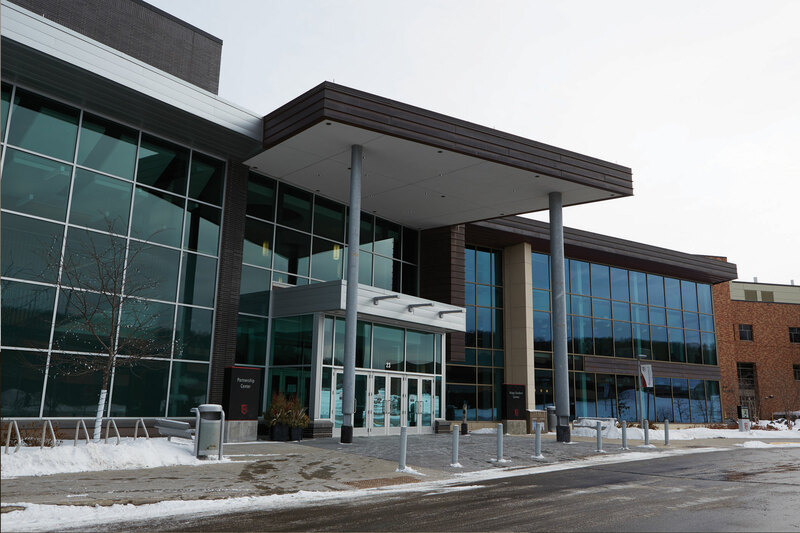 Today, the Normandale dental clinic is refreshed, which is a win-win for patients, students, and faculty. 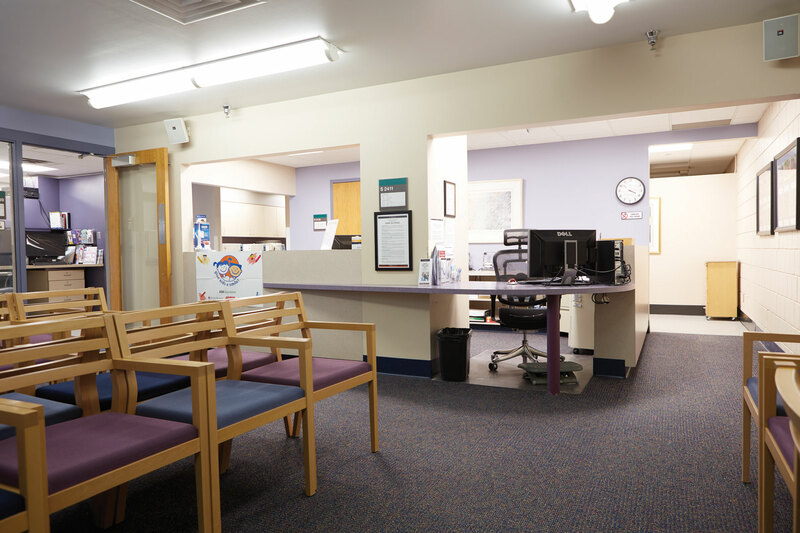 The flooring, wall colors, and ceiling tiles were replaced and the patient area is now a palette of gray tones, presenting a professional, polished entry to the clinic and throughout the patient care areas. Sleek A-dec 411 operatory chairs in charcoal and granite leather complement the palette, and are paired with A-dec delivery systems equipped with deluxe touchpads that hold integrated scalers and cameras, keeping them within easy reach. The A-dec LED lights deliver precise lighting at three different intensities. There are 24 operatories, with A-dec 411 chairs in granite and charcoal and radius delivery units that are ergonomical for both left- and right-handed students. The streamlined chairs surround patients in comfort, and along with the radius delivery units, they are adaptable for left- and right-handed students. 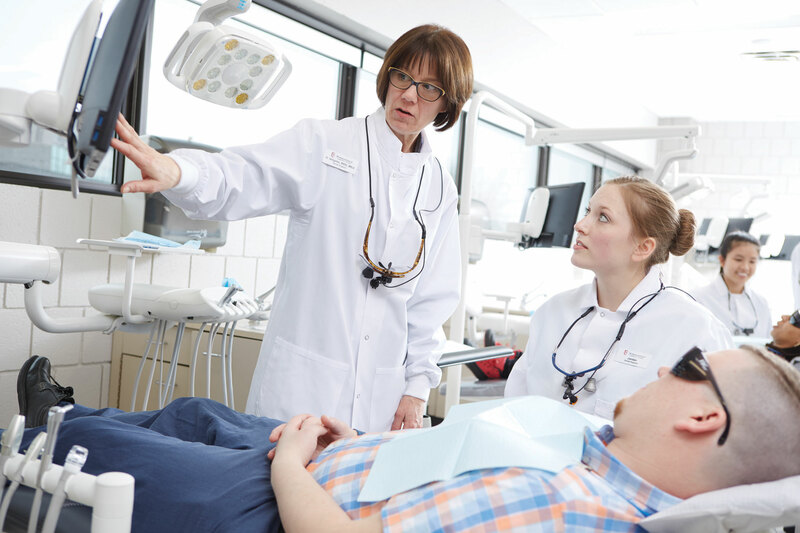 In every treatment area, Cavitron scalers replaced the underperforming ultrasonics, and a dedicated ACTEON SoproCARE intraoral camera is now within easy reach, allowing students to capture photos for case studies and documentation without leaving the patient’s side. A second patient-facing monitor expanded the students’ ability to offer patient education. 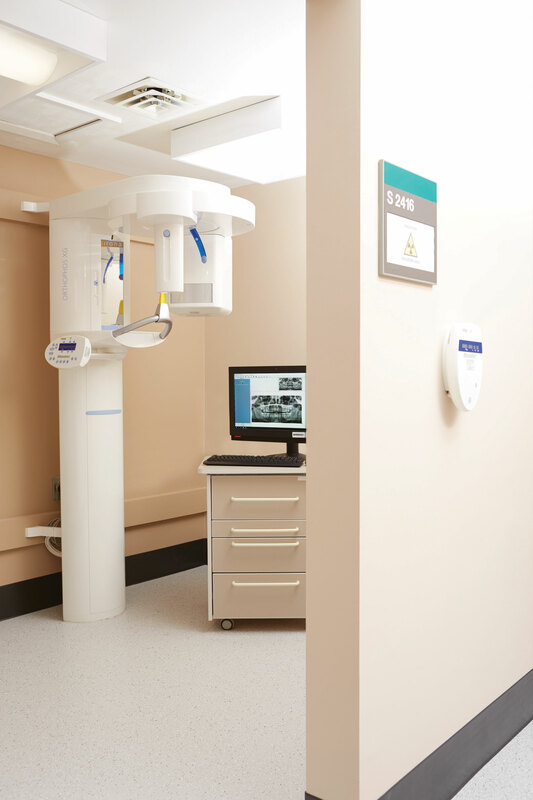 The clinic’s digital panoramic unit, Dentsply Sirona Orthophos, allows for precise images, which are displayed chairside on the newly installed second monitors. Students learn to use them as a tool when discussing treatment options. Both Mr. Minor and Dr. Brickle give high marks to Henry Schein’s service department for making the transition to the new equipment hassle-free. Dr. Brickle notes that ongoing support has helped both the faculty and students to adjust to the new equipment. Normandale and its administration is proud of the refurbished clinic. They believe strongly in giving students the best equipment on which to learn, while also fulfilling their mission of contributing to the community. So what do the students think? Educating dental professionals to provide oral health care – particularly in under-served communities – remains a vital priority, so the dental hygiene program at Normandale has some lofty goals on its next wish list, and all of them require incorporating new, emerging technologies into their workflow so that they will always have a program that reflects the latest clinical advances. Students are not the only ones giving high marks to the clinic’s new facelift. The faculty, too, is handing out its own report card, and it’s an impressive evaluation of the professionalism, knowledge, and service of its partners. 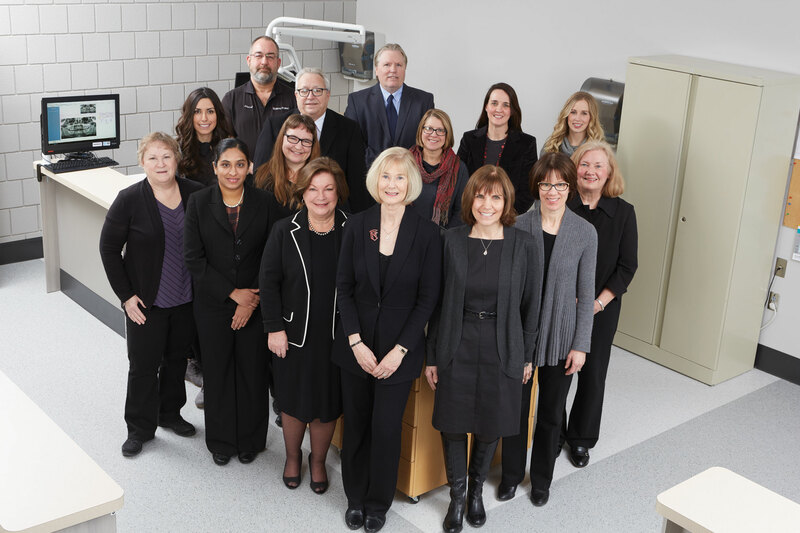 Front Row: Elizabeth Blazer, Clinic Manager; Archana Venkataraman, DDS, Staff; Carol Larsen, RDH, Department Chair; Colleen Brickle, EdD, RDH, Dean of Health Sciences; Deb Sidd, RDH Med, Faculty; Heidi Ahlgrim, RDH, Med, Faculty; Gale Chovanec, RDH, Med, Faculty. Second Row: Rachel Kashani-Legler, RDH, MS, Faculty; Laura Kinney, DDS, Staff; Holly Knutson, BSDH, MS, Faculty; Stephanie Zarse, BSDH, MS, Faculty; Megan Smith, BSDH, MS, Faculty. Third Row: Stuart Smith, Equipment Service Technician, Michael Minor, Regional Equipment Manager, Special Markets; Nick Hinrichs, Regional Operations Manager. This article was originally published in Sidekick Magazine.